DPU lecturer and EngD candidate, Pascale Hofmann, recently led the DPU strand of UCL's Global Citizenship programme and reflects on how it related to her research experience in Dar es Salaam. During the first two weeks of June, UCL runs its Global Citizenship programme, an annual simulation-based workshop that brings together undergraduate students from across the university, and aims to explore the biggest challenges that our increasingly connected World is facing. One of the Global Citizenship strands, Rise up! Negotiating urban change in Dar es Salaam has been run by the DPU for a number of years. The purpose is to help understand the challenges and opportunities for urban change in Tanzania, and has been led by Pascale Hofmann, a lecturer at the DPU and EngD candidate at UCL. Through simulation, student participants undertake roleplay exercises in which they are assigned to a specific stakeholder group within the context of Dar es Salaam, with the ultimate aim of negotiating and developing strategic alliances with other stakeholders to help address the challenges faced by the city’s lower-income settlements. For Pascale, the workshop provided a unique opportunity to engage with undergraduate students from a multitude of different disciplines and backgrounds, and enabled her to draw on her extensive research undertaken in Dar es Salaam, bringing real life experience to the simulation scenario. 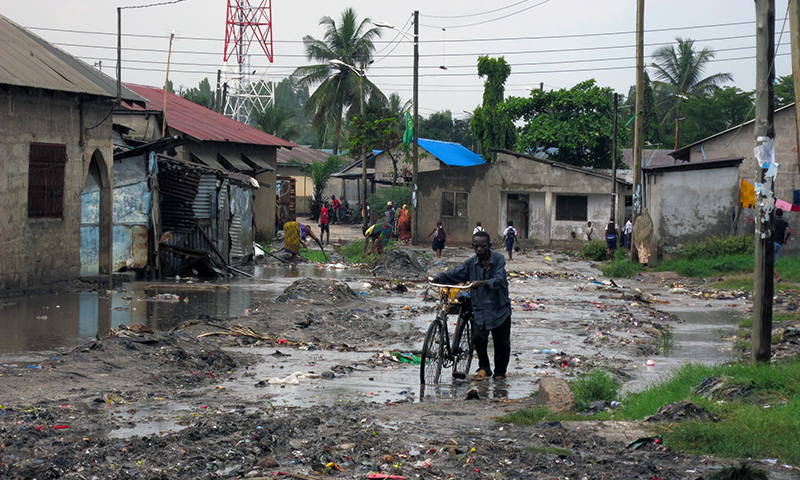 Pascale is currently working on her EngD research which is exploring urban water poverty in Dar es Salaam. She is investigating the issue from different perspectives to reveal how different stakeholders interpret or define, and act upon it. “I am mainly dealing with the notions of discursive and material practices, in other words the ‘doings’ and ‘sayings’” she explains. “Discursive practices very much encapsulate what people think, how they talk about particular issues. I have been exploring discourses around urban water poverty and how far they translate into actual material practices such as policy, legislation and concrete interventions”. “Often you get material practices that embed components from several dominant discourses at the local, national and international levels. And then you have alternative discourses that talk about lack of voice, that recognise issues around land and housing tenure, but they are not very influential in policy-driven processes”. The nuanced understanding of how different discourses compete, overlap and are used by various stakeholders within a particular urban setting is an aspect of Pascale's research experience that she hoped was translated into the Global Citizenship programme. For Pascale, the roleplay approach to Global Citizenship is a useful pedagogic technique. “You learn the most when you are put off balance and when you are challenged, if you work with likeminded colleagues the challenge isn’t there. The challenge is not necessarily to change your opinion but to defend it to those that think differently” she says. “This allows you to reflect on why it is that you think in a certain way, and you have to consider, justify and substantiate your argument when you have to defend it to somebody else”. Furthermore, in the case of undergraduate students it is particularly about exposing them to something they haven’t thought about or engaged with before. Students had to become somebody that they don’t necessarily share the same principles with. It’s not a for and against argument. Sometimes you make some allowances which helps you get a more nuanced understanding”. While Dar es Salaam offers student participants at Global Citizenship a very specific case study, the exercise emphasises issues and teaches skills that are transferable to different urban contexts. In addition to her EngD research, Pascale has experienced through other work how a city like Dar can provide a context in which translocal learning between partners from different cities can occur. Through a small project funded by the International Social Science Council, Pascale was part fo a team that brought together diverse partners from different countries and cities to take stock of what is known about water injustice, and what requires further research. "We had the rare opportunity to go to Dar with partners from other cities", she recalls. "We had a research proposal writing workshop there which allowed us all to be together in one room to discuss what it is that we want to research, and what are the pertinent issues in these different cities. In another instance, Pascale undertook a small project focussing on Lagos in order to assess whether there are similarities and differences to the case of Dar es Salaam. She explains, “we put forward a proposal to work with an academic institution in Lagos, and so the project allowed us to go there and carry out research similar to what I have been doing in Dar. After a multi-stakeholder workshop, we took our Nigerian partner to Tanzania where we did our pilot fieldwork in two lower-income settlements”. It is this aspect of transferring knowledge from one context to another that students are able to learn from the Global Citizenship programme. As Pascale explains, “we focussed on a very real problem that happens in Dar, and also many other contexts, even here in London. By framing the whole simulation through the lenses of urban sustainability and environmental justice, we can see signs of injustice in Dar, and that also helps us think about a topical issue such as the Grenfell Tower fire. Students can think about what they discussed in the Dar es Salaam case study, and they can see something similar happening here. It helps them to go through the world with eyes open and to notice things that they explored in detail in one particular case, and establish connections with a different context in terms of what is happening, trying to understand diverse points of views while recognising different levels of power relations at play”.